Rumbo al Sud is a web magazine under the editorship of Señor Marcelo Arcas. 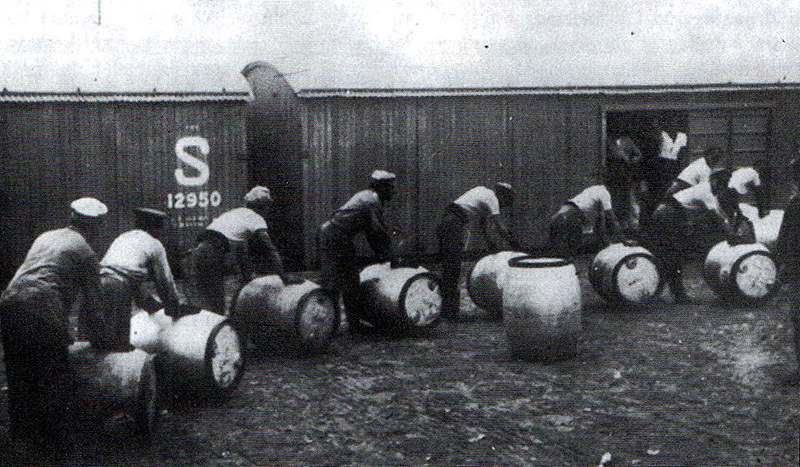 It deals with the history of railways south of Buenos Aires. It includes a paper on the history of the coaches of the FC Sud from its inauguration until nacionalization. 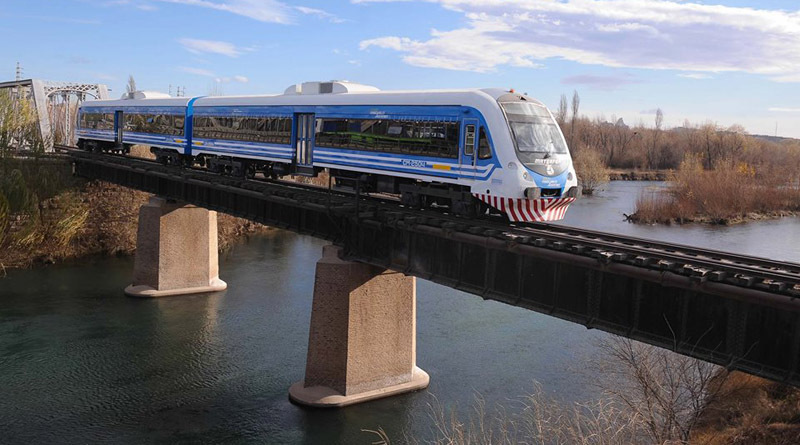 The FCS did not dedicate stock particularly to a single route, but nevertheless it helps in the understanding the variety of stock that may have been used on the Neuquén line. It can be found ( in Spanish of course) at <http://usuarios.lycos.es/arcasm/j-coches1.htm> (1). Link currently (January 2011) unavailable. 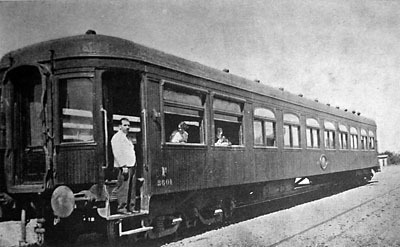 First class coach no. 2601, mounted on six wheel bogies, and being used as an inspection saloon. One of three of this type built in 1924. A livestock wagon of the usual Argentine type, with end doors so that the animals could walk on from an end ramp and fill the whole train in one operation. In contrast is this view at Pichi-Mahuida of a double deck sheep wagon about to be loaded through the end door via a ramp. Date – early 1930s. 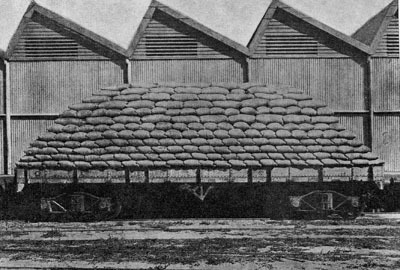 An open wagon, which would have been capable of carrying a maximum load of 45 tonnes, though when loaded with grain in sacks as here 33 tonnes would be a more likely maximum. 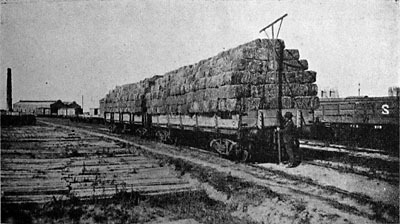 Baled alfalfa, presumably for livestock feed, being measured to ensure it was within the loading gauge. Another photo of a loaded wagon. 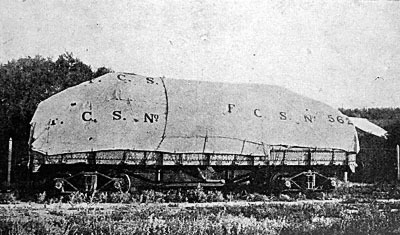 The method covers a wagon with three tarpaulins, arranged with the first two at the front protecting the load in the direction in which the train will proceed. A view found in the Motherwell Heritage Centre of a petroleum tanker built by Hurst Nelson and Company of Motherwell in the 1920s for conveying oil from the oil fields of Neuquén. 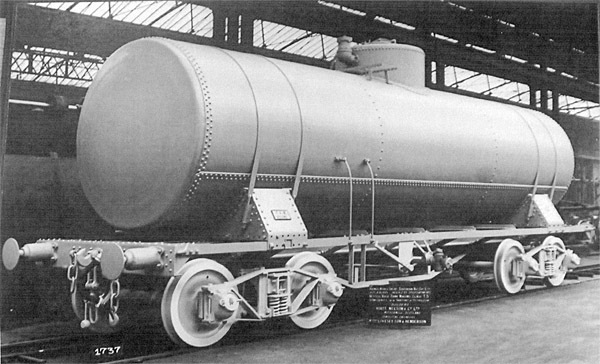 The board indicates that Livesey, Son and Henderson, the railway's London-based consulting engineers, were involved in its design, which can be recognised in the tank and its mounting, still evident today in some of Ferrosur Roca's tankers, and the characteristic axle box seen in close up further down the page. The plate on the left hand mounting carries on two lines F. C. S. and the fleet number. Screw couplings and side chains are provided, as is a continuous vacuum brake. Only one side chain has a hook, the other has merely three links, thus ensuring that they are connected as required by the rules, see extract from the Southern's 1928 Rule Book, kindly provided by Señor Héctor Guerreiro of Bahía Blanca, below. "Art. 234. Central threads and auxiliary chains. C. The auxiliary chains should be linked through the third link. They only come in to use to serve for pulling should the central coupling break." 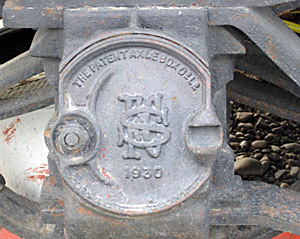 An FCS wagon axlebox cover, photographed in 2011. On 7 October 1909 a Presidential Decree (see below) was issued requiring the use of automatic couplings on all railways in the Republic. The British broad gauge companies resisted, and to this day the goods rolling stock on the broad gauge lines uses side buffers and screw couplings. However, when new stock was being built in the 1970s, provision was made to allow an easy change over, as can be seen in this end view. The Rolling Stock Engineer at Ingeniero White works indicated that a start was made in the conversion at that time (1970s), using the automatic coupling within fixed or semi-fixed rakes of wagons, which kept their buffers and screws at each end. However they found that the automatic coupling unsatisfactory as it displayed a propensity to uncouple when the train was in transit and so they reverted to buffers and screws. In the early 1970s Marcelo Arcas snapped No 4200, the last of the class 11B 2-8-0s at Patagones, acting as station pilot with a four wheel shunters' truck. Note how the wagon has its sides boarded in to improve safety and comfort for those riding on it. 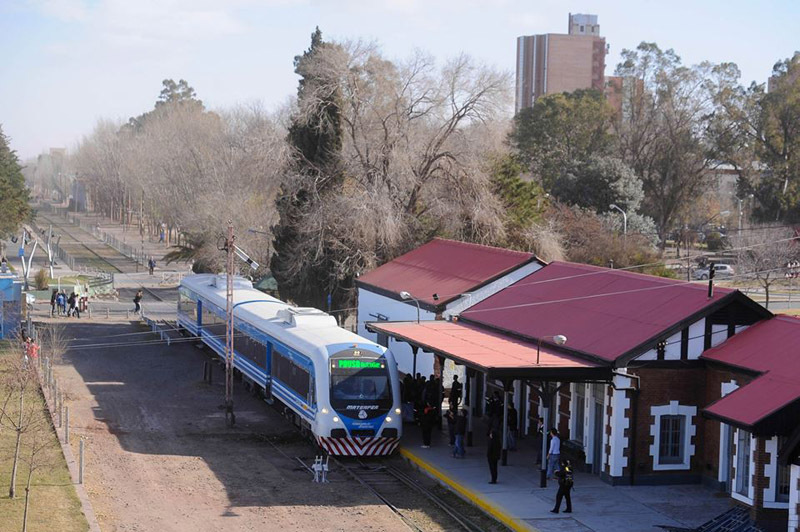 One of the surprising events of 2015 was the return of passenger trains to Neuquén, not long distance, but local operating between Neuquén and Cipolletti, adjacent stations along the line. This is an attempt to reduce traffic congestion between these two places on Ruta 22 through the funnel caused by the bridges over the river Neuquén. Also on the same posting was another view showing it leaving the Cipolletti side of the big bridge over the Neuquén. The service provided comprises 10 round trips a day at 70 minute headway. The operator is not a private concessionaire, nor either of the two provinces, but central government. The unit comprises a motor coach and trailer. Power comes from a Scania diesel engine with hydraulic transmission. Each coach has a capacity for 72 on non-reversible reclining seats with seat belts. 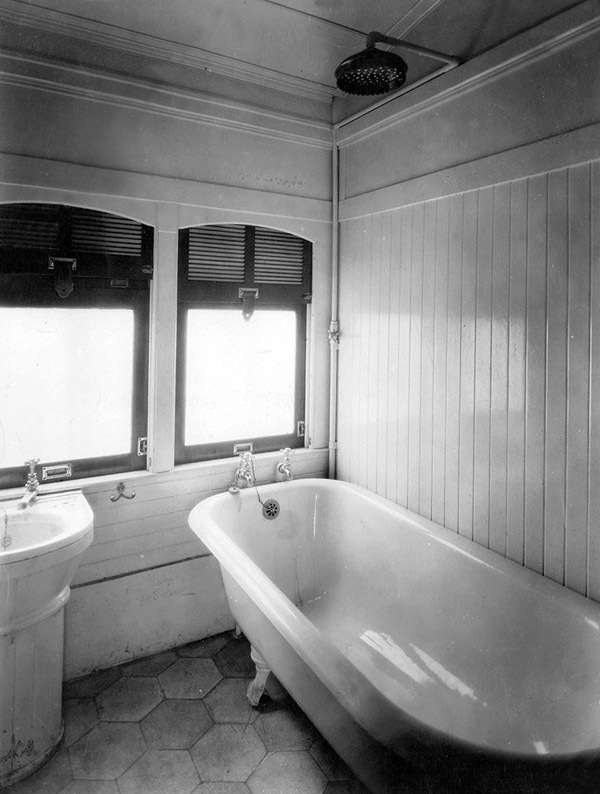 There is a toilet in each coach and lighting, as befits a modern design is LED. There are security cameras within and externally for a rear view. 1 Los coches del Ferrocarril Sud. Marcelo Arcas. Rumbo al Sud (web magazine). <http://usuarios.lycos.es/arcasm/j-coches1.htm>. Link currently (January 2011) unavailable. 2 Construcción e Inauguración . . ., Chapter 2. Pages 233, 376, 366, 369 and 368 respectively. Mi Vida de Ferroviario Inglés en la Argentina 1887-1948. Arturo H. Coleman. 1949 Published privately. 3 Found on Facebook, (25/7/15, no longer available). 4 Found on Facebook, Comodoro Rivadavia (25/5/16, no longer available). 5 Found on Facebook, (11/7/15, no longer available).